WILLEMSTAD - The unions PWFC, Apri, SEU, StRAF, STSK, STO and BTG have called their membership for an urgent meeting tonight at the BTG headquarters in Marie Pampoen. The only agenda item for the meeting is the minimum wage. 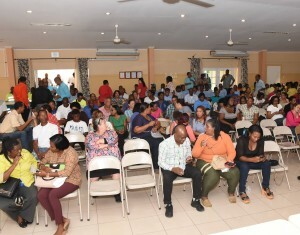 BTG Chairman Frensley Sille indicated that he has asked all the members and workers in general that receive a minimum wage to attend this meeting. Former Minister of Labor, Ruthmilda Larmonie-Cecilia, who during her term approved the National Decree to adjust the minimum wage, will also attend. Sille says that they will not accept that the current government will postpone this adjustment to a later date. “This is unacceptable and that is why we have invited the former minister to come and answer our questions,” said Sille. The union leader reminded the government that decree does not say that it is an increase in the minimum wage, but an adjustment and it was already approved.